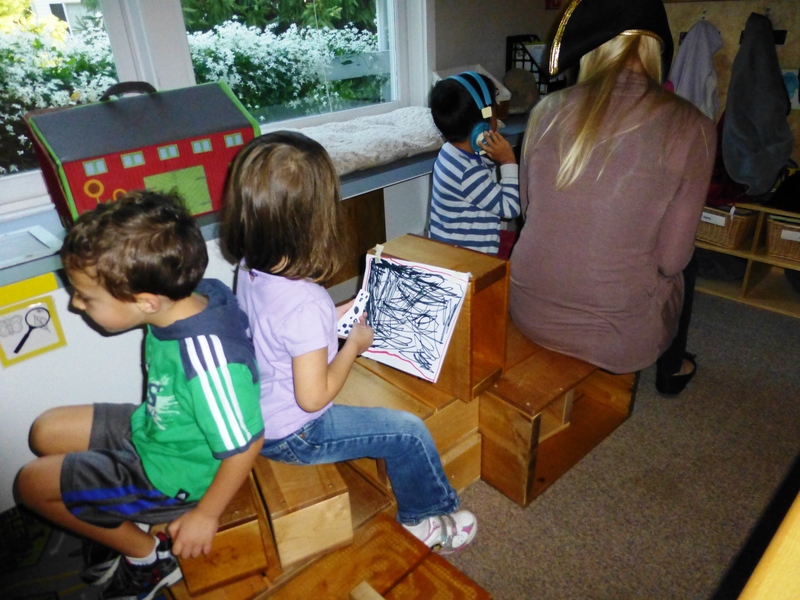 This week, the students began experimenting with the big blocks and what could be created while playing with them. At first, they were used to make buildings of various sizes and shapes, but that interest quickly waned. It wasn’t until they realized how much fun it was to sit/stand on the blocks that real excitement began. It was then that our airplane was born. Props were quickly found so that some students could pretend they were the pilot (or multiple co-pilots) while some students started designing props that the passengers might need. It was quickly designated that pilots were those that wore headphones (or pirate hats) and passengers were anyone who could fit on the blocks behind them. One child even made a TV and a remote out of paper so that she would have something to do on the flight. Only the best for our passengers! Next came the pilot’s instructions. It was vital for the passengers to know what they could and could not do while on the plane. Perhaps it mostly involved things they were not allowed to do, including wearing hats, but it was imperative that the passengers listened to each instruction carefully and followed them without question. Soon enough, we were in the air and snacks/drinks were dispensed to all, despite the previous instructions not to eat or drink during the flight. However, the trip was short lived. Before we knew it, we were landing at our destination and grabbing our luggage from underneath the plane. The pilots politely bid the passengers farewell and then began preparing for their future flights.